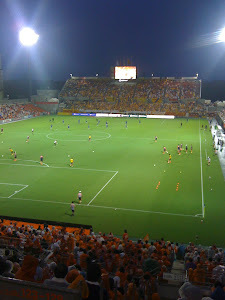 In our 2nd group game in the Nabisco Yamazaki cup we went away to Kashima Antlers. This season the Antlers have been having a torrid time in the J League and if I'm right have failed to score a goal so far. However they have had better luck in the League Cup and they chalked up another victory with a 1-0 win over the Squirrels. The goal was scored by Koroki on 31 minutes when Kitano came out to clear the ball away from an oncoming Antlers forward, but only managed to (unwittingly) pass the ball to Koroki who finished with ease. The game was lost but it remains very early days in the Nabisco Yamazaki Cup group stage, there are plenty of games left for Ardija to get more points. To be homiest though, I would trade success in this 3rd competition for valuable wins in the J League, especially some wins at the Nack 5 in front of our own supporters. Was Verdenik sacking the right decision? Consadole are coming to town! We're Back (And We've Moved)!